Mannheim is a city in Germany. With 311,342 inhabitants it is the second-largest city in the state of Baden-Württemberg after the capital Stuttgart. Mannheim is situated at the confluence of the rivers Rhine and Neckar, in the northwestern corner of the state of Baden-Württemberg. The Rhine separates Mannheim from the adjacent Rhineland-Palatinate city of Ludwigshafen. The Hessian border is north of the city. Mannheim is the largest city of the Rhine Neckar Area, a metropolitan area with 2.4 million inhabitants. Mannheim is unusual among German cities in that its central area is laid out in a grid pattern (called Quadrate, squares), much like many North American cities. The main route through the squares leads to an enormous 18th-century palace. This former seat of the Electors of the Palatinate now houses the University of Mannheim. Mannheim's city symbol is der Wasserturm (the water-tower), located in the east of the city centre. Mannheim is start and finish of Bertha Benz Memorial Route. 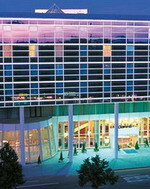 The Dorint Kongresshotel Mannheim, in central Mannheim, is an extraordinary building with the guestrooms set in a glass box on stilts suspended over the curved lobby and public areas. The 287 guestrooms, over six floors, have simple yet elegant contemporary furnishings and light pastel decor. All are equipped with satellite television with pay movies, direct-dial phones, desks and minibars. Bathrooms have complimentary toiletries, hair dryers and makeup mirrors. Hypo- allergenic bedding and cribs are available on request. The hotel's Rosengarten Restaurant features contemporary furnishings and serves regional specialities and international cuisine, while Bar Jazz serves a wide range of drinks and snacks to the accompaniment of live music, and the Kastanienterrasse features outdoor dining. The hotel has its own hair salon which offers beauty services, and there is fitness equipment, an indoor heated pool, a sauna and a solarium on site. 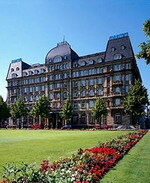 The Maritim Parkhotel Mannheim is housed in a turn-of- the-century Art Nouveau building, centrally located on Friedrichsplatz opposite Mannheim's landmark Wasserturm (Water Tower), 500 metres from the train station. The 173 modern guestrooms are decorated in light colours with dark wood furnishings. Amenities include air conditioning, satellite television with pay movies, wireless Internet access and high-speed (wired) Internet access (surcharge), telephones, hair dryers, minibars and safes. Guests can enjoy a refreshing dip in the hotel's indoor pool, relax in the sauna, steam room and massage suite (fee), or top up their tans in the solarium. The restaurant serves a selection of international dishes in an elegant, formal setting and Papageno is a rustic pub offering regional and international food along with a range of beers and wine. The hotel also houses a bar where guests can sip cocktails to the accompaniment of piano music. 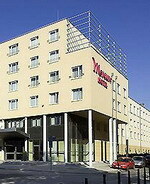 The Mercure Hotel Mannheim am Rathaus is located in Mannheim, Germany, one kilometre from the city centre and two kilometres from the Carl Benz Stadium. 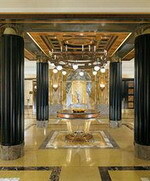 This modern hotel offers a currency exchange service at the 24-hour front desk, and seven meeting rooms are available. Wireless Internet is accessible in the air-conditioned public areas. 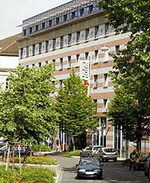 The Mercure Hotel Mannheim am Rathaus' Olive Tree restaurant serves a range of regional dishes for lunch and dinner, and the Hotelbar Piemont serves drinks. The hotel's 150 guestrooms all have satellite television, wireless Internet access, climate control, desks, and hair dryers. Nuremberg/Nürnberg is a city in the German state of Bavaria, in the administrative region of Middle Franconia. It is situated on the Pegnitz river and the Rhine-Main-Danube Canal and is Franconia's largest city. It is located about 170 kilometres north of Munich. Whether it’s the famous Christmas Market ("Christkindlesmarkt"), music festivals ("Bardentreffen") or international Trade Fairs – there are many reasons to visit Nuremberg. In the InterCityHotel Nürnberg you are in the middle of it all. The historical old-town is a few minutes walk away and the so called "cultural-mile" starts directly at the hotel’s door. The train station is just around the corner, offering the best connections and the opportunity for you to make use of free travel on the local public transport system by using your room ID card. Bridge the waiting time to the Christmas Eve with a visit to the beautiful Christmasmarket in Nuremberg. Le Meridien Grand Hotel Nurnberg is located 200 metres from the main railway station and overlooks the entrance to the historical city centre of Nurnberg. This renovated 19th-century five-floor hotel features 186 guestrooms furnished in an Art Nouveau style, with richly-coloured drapes and carpets. Some guestrooms feature antique furniture, most have air conditioning and all include cable televisions, direct-dial phones with voicemail, minibars and high-speed Internet connections. Marble bathrooms include hairdryers, slippers and complimentary toiletries. Executive and Presidential suites also feature separate sitting rooms and spa baths. After a long day of business or sightseeing in Nurnberg, guests of the Le Meridien Grand Nurnberg can work up a sweat in the fitness studio before unwinding in the sauna or massage room. 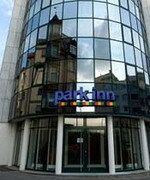 Located just steps from the medieval Old Town in Nuremberg, the new Park Inn Nürnberg Hotel offers colourful and vibrant rooms ideal for business and leisure travellers. Guests can enjoy a city centre Nuremberg hotel that is walking distance from top attractions such as the famous Kaiserburg Castle, the buzzing market square and the gothic churches of St. Lorenz and St. Sebaldus. Major business nearby include Datev, Eletrolux and Telekom. Nuremberg's main fair grounds are 15 minutes away from the hotel. Guests can enjoy exceptional high-levels of service from the staff's Yes I Can! service philosophy. The hotel restaurant offers a relaxing terrace in the courtyard as well as a private dining room. Filled with charm and character, the hotel bar is the ideal place end your day. Rooftop fitness centre with sauna and solarium with views over Nuremberg.